In the coming days, Dia de los Muertos will be celebrated across San Antonio at a variety of venues. 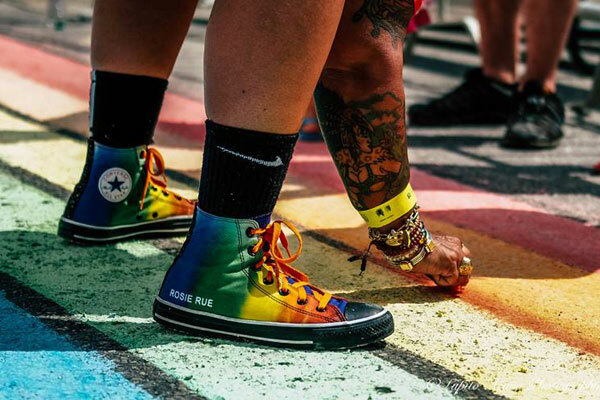 The observances range from community processions, to displays of altars and, at least at one soiree, an all-star drag show. Following are some events where you can celebrate the Days of the Dead. 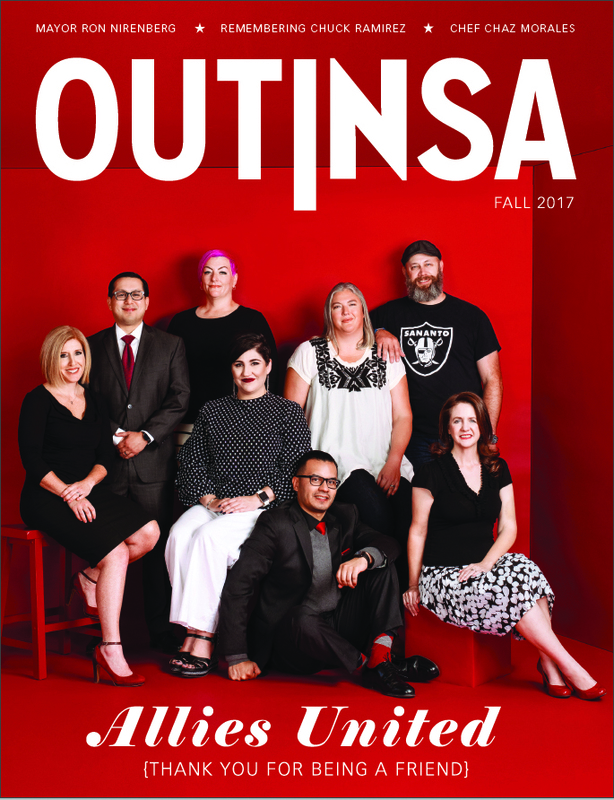 This is the eighth year that stylist Rene Roberts presents the Dia de los Muertos Ball, a drag show and party that benefits food banks at churches around San Antonio and provides scholarships to high school seniors. This year’s show, dubbed Clash of the Titans, has a lineup of performers that includes the San Antonio Dance Krewe, Danika Daniels, Kandi Lac R Savage, Lady Tiffany, Aaron Andrews, Taryn Taylor, Amerie Parker, Toni Raven Andrews, Donet McKim, Kourtney Deveraux, and Tencha La Jefa. Roberts will also pay tribute to Jaime Martinez who died in July and who for the last 17 years of his life served as founder and chairman of the Cesar Chavez Legacy and Educational Foundation, the organization that annually produces the Cesar Chavez March in San Antonio. Saturday, November 4 from 6 p.m. – 12 a.m. at the Guadalupe Theater, 1301 Guadalupe St. Tickets are $35 general admission or $250 per table which seats four. Doors open at 6 p.m. Show time is at 8:00 p.m. Food and Modelo beer provided. BYOB. 21 and over only. Must come in Dia de Los Muertos costume or you might not get in. Tickets can be purchased by cash, check or credit card at Rene Roberts, 812 Cincinnati Ave., (210) 324-2662. No online sales available. Check out the website at this link. 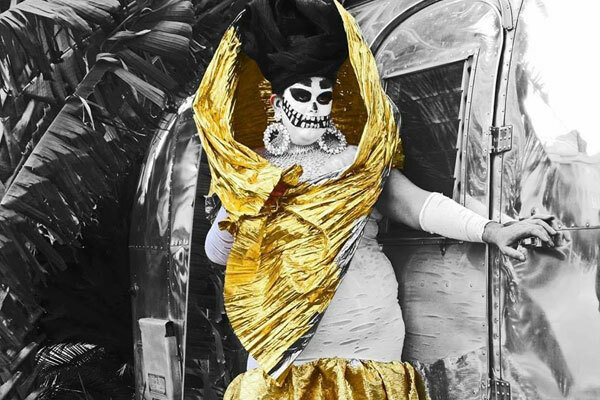 Esperanza Celebrates Día de los Muertos! The Esperanza Peace and Justice Center invites the community to celebrate dearly departed friends and family at their annual Dia de los Muertos celebrations. This year’s event features Grammy Award winners Los Texmaniacs and Leonardo “Flaco” Jiménez. There also will be displays of community altars, live music, face painting, and a procession through the neighborhood featuring Grupo Tayer from Monterrey, Mexico. Wednesday, November 1 from 4 p.m. to 10:30 p.m. at the Rinconcito de Esperanza, 816 S. Colorado. Free admission but donations accepted. More information at this link. The Guadalupe Cultural Arts Center’s Day of the Dead celebration will feature face painting, pan de muerto and hot chocolate, and performances by the Groupo Animos youth theater ensemble, the Mariachi Academy, Dance Academy and a Peace and Remembrance Procession. The Galería Guadalupe will have an exhibit of traditional altars created by community members and invited artists. Saturday, October 28 from 12 noon to 6:00 p.m. at Plaza Guadalupe & Galería Guadalupe, 1327 Guadalupe Street & 723 S. Brazos Street. Display of altars continues through November 9. Free admission. More information at this link. Muertos Fest includes a high-stakes competition between elaborate, artist-created altars honoring family members, friends, pets, and pop culture icons along with a lineup of live music, poetry readings, artisan vendors, face painting, kid-friendly activities and a lively drum and puppet procession. The entertainment lineup includes Las Tesoros de San Antonio, Azul Barrientos, the Guadalupe Dance Company and Mariachi Nuevo Jalisco. Saturday, October 28 from 10 a.m. to 11 p.m. and Sunday, October 29 from noon to 10 p.m. at La Villita, 418 Villita St. Free admission. More information at this link. 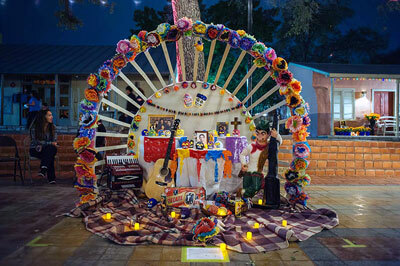 For two days, Pearl Park will be transformed into the rich traditional Mexican holiday that remembers family and friends that have passed away with altars, music, a procession, children’s crafts, and programming. The first day will be focused on children’s workshops, performances, milkshakes by Honeysuckle Tea Time, Pan de Muerto by Panifico, and literary artist Carmen Tofolla will read and emcee the evening performances. The second day will feature a reading by Kristin Forrester, performances by Patricia Vonne and the all-female mariachi group Las Coronelas and a procession. Both days will feature stilt walkers by the Guadalupe Dance Company and alters by regional artists that include: The Guadalupe Cultural Arts Center, Art Pace, Regina Moya, Franco Mondini-Ruiz, Cruz Ortiz, and Cristina Sosa Noriega. Wednesday, November 1 from 4 p.m. to 8 p.m. and Thursday, November 2 from 5 p.m. to 9 p.m. More information at this link. Every year, SAY Sí curates one of San Antonio’s most comprehensive Día de los Muertos celebrations, providing educational context to the important holiday with three days of unique cultural happenings including: a multidisciplinary showcase of student art, altars to honor the departed, family folk art workshops, food booths, an artisan mercado as well as live cultural performances highlighting local dancers, musicians and entertainers. This year, SAY Sí will also reveal two large-scale sculptures created in collaboration with Colectivo Ultima Hora, a renowned 6-member team of Mexican artists. Opening Night Fiesta: Thursday, November 2, 7:00 – 10:30 p.m. $35 Pre-sale, $40 at the door. (Only 100 tickets available) Purchase tickets at this link. https://give.classy.org/MFest2017. First Friday: Friday, November 3 from 6:00 to 10:00 p.m. Free admission. 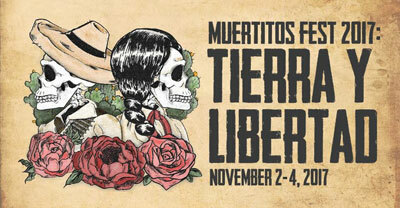 Muertitos Fest Family Day: Saturday, November 4, 12:00 to 4:00 p.m. Free admission. More information at this link.